I started writing this as a post about you, but since your dad created this cool collection of letters to you, I figured, why not write this to you? Ever since we had you, the question on everyone’s mind is “How is it being a mom?” It’s such a profound question, the answer to which is oftentimes difficult to verbalize — that I end up going with something cliche like “amazing,” “magical,” or “life changing.” And it has been all of those things — but what all those answers miss is how much it’s changed me as a person, what’s important to me, and how I relate to the world around me. Of course, and most obviously, it rendered our lifestyle unrecognizable — and that’s OK because our lives are filled with love, magic, and wonderment that make all the adjustments more than worth it. But most importantly — and less obviously — it’s made me grow as a person. I kinda knew it would happen though — and long before I had you, I had welcomed this change with open arms. Because, you see, I felt like I had stopped challenging myself and growing. If I’m ever in a bad mood, all I need to do is see your face. And not just because you are impossibly, heart-stoppingly cute — but because I have so much to learn from you. You are so comfortable in your own skin and so full of joy (when you’re in a good mood :). Your smile isn’t a fake one that adults sometimes flash at each other out of politeness. If you’re happy, you smile with your excruciatingly adorable toothless smile. If you’re not happy, you cry. If you’re super happy, you laugh and emote with your whole body. The joy just pours out of you — and I love watching joy activate your little hands waving, your little feet kicking and your whole body shaking with laughter. Your joyfulness isn’t conditional and isn’t designed to make someone else feel a certain way about you. It’s truly authentic — and thus, extremely contagious. Just like your joyfulness, your love is unconditional. I know you love us — and even though you can’t say it yet, I can see it in your eyes. Your beautiful, brown eyes, in which I can get lost all day. You just love. Not because or in spite of something — but just because that’s what people do, not expecting anything in return. Your pure, unconditional love is something I can learn from. And I love you right back. Here’s another cliche: “You never knew love like this before.” But it’s so true. When I was pregnant, someone told me that having a baby is like discovering a new room in “the house of you” that you didn’t know was there. It’s exactly like that. My love for you doesn’t take away from any other love — but it swells my heart so full. As a matter of fact, I feel more love and more connection with all moms and children of the whole world. All of a sudden, I feel more love towards life and all people in it. Your every emotion and every action seems to say: “I’m here, this is me, take me as I am” — and I love that about you. 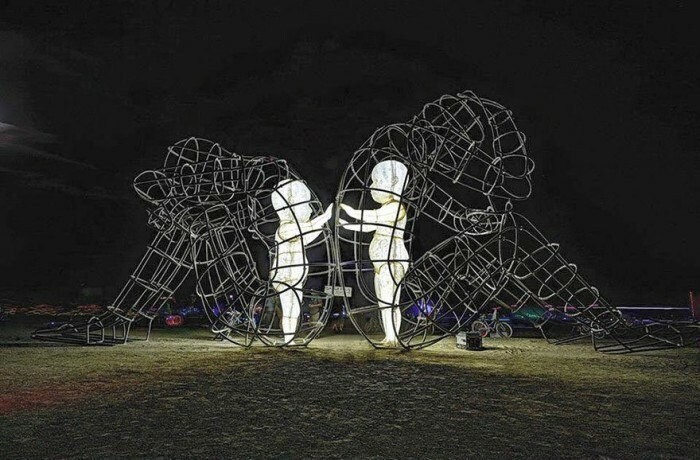 A few months ago, all of our friends went to Burning Man, a beautiful celebration of art and community. I’ve never been, but it seems every bit the experience I would love. Of course, we didn’t go because you were just a wee baby — and I doubt I’ll go anytime soon. But I saw pictures, and among the pictures I saw was this beautiful installation that immediately made me cry. 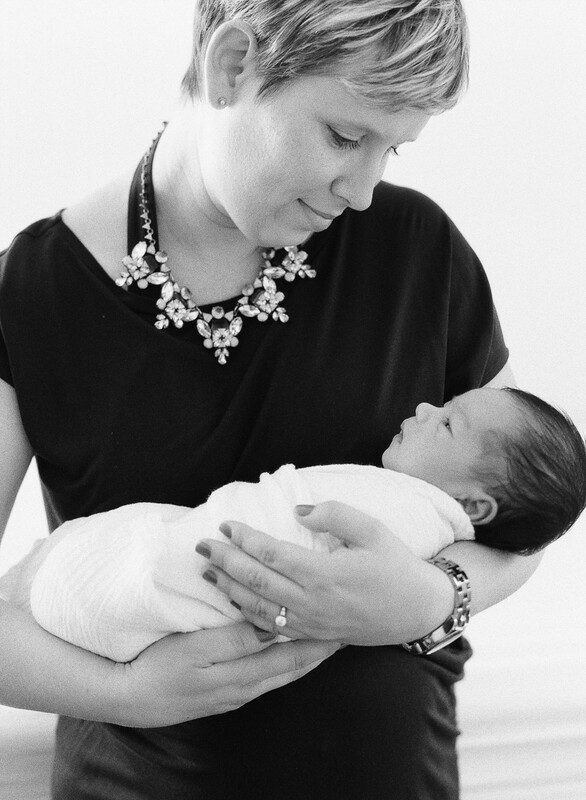 As a new mom with you in my arms, it held a special meaning. This piece truly captures the purity of a child’s love, acceptance and curiosity — while adults are far too fast to turn away. If we were more like kids towards each other, can you imagine where we’d be as a society? Please promise me that you’ll always retain your purity and capacity for love. It’s not the easy choice, and you definitely won’t be there 100% of the time — but at least be better than us. Unencumbered with mental clutter and society’s ideas of what you should do and how you should feel, you are just there — marching along to the beat of your tiny little drum. You absorb every moment, every sound, every texture. You encounter everything in the world for the first time, and approach everything with a wide-eyed wonder. I love watching the world through your eyes — I can just see the wheels turning. I’m a bit jealous because I wonder what it would be like to experience everything for the first time, the way things really are. As adults, we have become so jaded that we have lost our ability to marvel at the very tiny miracles of every day. We take every day for granted, and even though most of our routines are nothing exciting, if you really look, there are tiny little specks of wonder. The way the sky is different today from yesterday, the way the raindrops hit the tree leaves — there’s beauty and opportunity for discovery every day. Because we are constantly living under a barrage of other people’s fabulous vacation photos and magnificent events, there’s always a FOMO: fear of missing out. The truth is, grass is always greener on the other side — and you must remember that what you’re seeing is a carefully orchestrated highlight reel. Even the strongest of us (I consider myself mostly immune to such things) sometimes get FOMO. But when I was pregnant with you, a strange thing happened. My body needed extra rest and wasn’t feeling great a lot of the time — and so I no longer started feeling FOMO. There was nothing I could miss out on that would be better than kicking up my feet and feeling you kick. And after you were born, the only FOMO I’ve ever felt was when I was at a fabulous event, but without you. Before I had you — and probably one of the biggest reasons that we took so long to have you — was because I was not ready for such a big change. I was afraid that it would change my identity. As a career focused woman, it was important for me to retain that identity — and not disappear into my family. While people you love are the most important thing in your life (by a mile), it’s also important to pave your own path, have your own interests and your own identity. Being a parent is all-consuming, but if you are mindful of it, you can retain all these facets of your life. One thing that worried me is that I’d have to give up my travel habit (I have wanderlust in the worst way — if I have any FOMO, it’s around seeing the world). Being a “citizen of the world” is a big part of my identity. Now, to be honest, travel is a bit of a challenge these days — but when you get bigger I plan to take you with me. Yes, it will be challenging — but it will be 20000% more rewarding to share these experiences with you and to watch you become more worldly and a beautiful, compassionate human being as a result. What identity and balance also means is that I had to become less rigid and allow myself to fully embrace the sweet and the challenging parts of motherhood. I realized that being either a mom or a career woman was an antiquated approach. I’m both. And I love being both. I love making things that make the world a better place — I build communities for a living, where people can come together and become better at their work and their life. And you are the best thing I’ve ever made. Patience has never been a virtue of mine — and neither has been letting go of control. I don’t know if it’s a personality trait or a byproduct of being an only child.. But I must have things on my schedule and my way. This is more than a little ironic, given the job I do — but I’ve learned to compensate for it and not let people in on the internal struggle that happens. Well, that clearly went out of the window when you were born. And I’m happy it did. In life, things will rarely go according to plan — and being able to adjust quickly will help you come out ahead. Also, sometimes you must wait, but when you do, you get what you always wanted. Cultivating patience makes it easier to bear — and with less anxiety. When you become a parent, you must relinquish all expectation of having control — and when you do, things go so much better. When I learned to do that, I could enjoy my time with you more and I was generally happier. Funnily, one key thing that I’ve learned is that planning can help you be more flexible and get things done that you need to do. For example, before you were born, dad and I would be able to both go out and get a haircut at the same time. Now, we have to take turns, so one of us could watch you at all times. Planning ahead has improved our communication, and we can now get more done than if we didn’t plan ahead. When you become a parent, you have less time for just about everything. Which means that some things completely fall by the wayside — and you become that much more focused (and even better) in achieving the things that are important to you. You focus more intensely on things that are important — sometimes at expense of some other things (it took me months to write this, in favor of keeping you alive :) You also don’t have hours and hours to achieve work tasks, leisurely checking Facebook — instead, you get straight to the point. And finally, you are more accountable to yourself about how you spend your time. Having you has been a really great exercise in prioritization and at making decisions that I can be proud of. I left a job I wasn’t happy at because I couldn’t bear the thought of leaving you during the day to go somewhere I wasn’t happy. In fact, it made me reconsider what was important to me now that I’ve changed. One of those things was a family-friendly environment and colleagues who have kids, as well as building something impactful. When you think that way about your job, leaving a small baby at home becomes easier. Being your mom has truly been the most amazing experience of my life — and we are only getting started. Your love, sunny disposition, and boundless curiosity, are awesome, heartwarming, and inspiring. Of course, adjusting to such a big change is not easy — but it’s only through challenges that you change and get better. I urge you to always seek out challenges that you think will make you better, sharper, grittier. And remember, when you stop changing, you start dying. Thank you for keeping me on my toes — and younger. I can’t wait to spend a lifetime teaching and loving each other.